LED ZEPPELIN 1st LP 1969 TURQUOISE 1st Press! EARLIEST EVER!! TYPE 1 LABELS!!!! On offer here is a VERY rare LP (especially in this condition!!!!) by Led Zeppelin called "Led Zeppelin" and is an ORIGINAL1969 UK1st Pressing on the 1st Press Red/Maroon (Plum) Atlantic label!!! THIS LP IS SERIOUSLY RARE AND VIRTUALLY IMPOSSIBLE TO FIND!!!! THIS WASLED ZEPPELIN'S FIRST & RARESTLP EVER - AND VIRTUALLY NEVER TURNS UP FOR SALE!!!! JUST TRY AND FIND ANOTHER ONE!!!! IT ONE OF THE MOST SOUGHT AFTER LPs ON THE ATLANTIC LABEL - AND IS INCREDIBLY HARD TO FIND TODAY!!!! BUT WHAT MAKES THIS LP ESPECIALLY RARE - IS THATITIS THE ULTRA RARE 1ST PRESSING OF THIS LEGENDARY LP - WITH 'TURQUOISE LETTERING' ON THE COVER FRONT AND 'SUPERHYPE' CREDIT ON THE RECORD LABELS!!!! ONLY AN ABSOLUTELY TINY HANDFUL OF THE 'EARLIEST' 1ST PRESSINGS ONLY - EVER HAD THIS ULTRA RARE 'TURQUOISE' SLEEVE LETTERING - BEFORE IT WAS IMMEDIATELY CHANGED TO THE COMMON 'ORANGE LETTERED' COVERS THAT FOLLOWED!!!! AND THE LABEL CREDITS WERE ALSO LATER CHANGED FROM 'SUPERHYPE' TO 'WARNER BROS'!!!! BUT WHAT MAKES THIS LPREALLY SPECIAL IS THAT IT IS THE 'EARLIEST' 1ST PRESSING EVER MADE - WITH DIFFERENT (& EARLIEST POSSIBLE!) MATRIX ENDINGS!!!! 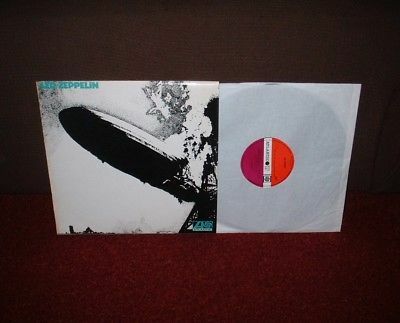 AND THIS IS ALMOST IMPOSSIBLE TO FIND ON THIS LP -ANDMAKES IT THE 'EARLIEST' & RAREST LED ZEPPELIN LP EVER MADE!!!! WHEN THIS LP WAS FIRST RELEASED ONLY AN ABSOLUTELY TINY HANDFUL OF 'TURQUOISE' 1ST PRESSINGSONLY - WERE EVER PRESSED WITH UNCORRECTED 1ST PRESS MATRIXES (SEE PICTURES! )AND THESE WERE IMMEDIATELY CHANGED PRIOR TO RELEASE!!!! ALL LATER 'TURQUOISE' 1ST PRESSINGS (AND ALL THE 'ORANGE LETTERED' PRESSINGS THAT FOLLOWED! )HAVE AN EXTRA 'ETCHED' NUMBER '8' ADDED TO THE MATRIXES AND SHOW A LATER PRESSING!!!! IN FACT, VIRTUALLY EVERY PRESSING OF THIS LP HAS THIS 'EXTRA8' ETCHED ON THE MATRIXES - (EVEN MOST OF THE 'TURQUOISE' 1ST PRESSINGS!) AND IT IS VIRTUALLY IMPOSSIBLE TO FIND ONE OF THE 'EARLIEST POSSIBLE' 1ST PRESSINGS WITH UNCORRECTED 1ST PRESS MATRIXES LIKE THIS ONE HAS!!!! SO DONT UNDERESTIMATE THE SERIOUS RARITY OF THIS LP!!!! BECAUSE, NOT ONLY IS IT THE ULTRA RARE 1ST PRESSING WITH 'TURQUOISE LETTERING' ON THE COVER FRONT AND 'SUPERHYPE' CREDIT ON THE LABELS - BUT IT IS THE 'EARLIEST POSSIBLE' 1ST PRESSING EVER MADE, WITH AMAZINGLY RARE UNCORRECTED MATRIXES ASWELL!!!! SO THERE IS ABSOLUTELY NO DOUBT AT ALL - THAT THIS IS THE 'EARLIEST'AND RAREST 1ST PRESSING OF THIS AMAZING LP THAT YOU CAN POSSIBLY GET!!!! THIS LP IS EVEN RARER STILL - AS IT IS ALSO HAS THE 'EARLIEST' 1ST PRESS 'TYPE 1' LABELS - WITH NO NUMBER ERRORS IN THE CREDITS!!!! ORIGINALLY IT WAS THOUGHT THAT THE MIS-NUMBERED COPIES WERE EARLIER, BUT AFTER EXAMINING MANY STAMPER NUMBERS FROM MANY DIFFERENT ISSUES - IT IS CLEAR THAT THE 'JEWEL MUSIC' NUMBER ERRORED COPIES WERE ACTUALLY LATER THAN THE 'EARLIEST' 1ST PRESSINGS WITH THE CORRECT LABELS!!!! AND THIS SHOULD COME AS NO SURPRISE REALLY, AS ON LED IV THE 'FEATHER' ON THE LABELS CHANGES POSITION TWICE MID WAY THROUGH THE PRESSING RUN, AND THE TRACK 'MISTY MOUNTAIN HOP' CHANGES TO 'TOP' TOWARDS THE END OF THE 1ST PRESSING RUN OF THAT LP TOO. AND OF COURSE ON 'LED ZEPPELIN III' THE TRACK 'CELEBRATION DAY' IS ALSO CHANGED MID RUN. SO IT IS CLEAR THAT MID RUN CHANGES ON LED ZEPPELIN LPs ARE VERY COMMON INDEED. AND IT IS ALSO 100% CLEAR THAT THIS LP HAS THE 'EARLIEST' 1ST PRESS 'TYPE 1' LABELS WITH THE CORRECT NUMBER ORDER ON THE CREDITS (LATER ONES DONT!)!!!! SO NOT ONLY DOES THIS LP HAS THE 'EARLIEST' 1ST PRESS COVER & MATRIXES - BUT IT ALSO HAS THE 'EARLIEST' 1ST PRESS RECORD & 'TYPE 1' LABELS, PROVING THAT THIS RECORD IS COMPLETELY ORIGINAL TO THE COVER FROM 1969!!!! NOT ONLY THAT BUT THIS LP IS IN BRILLIANT CONDITION FOR ONCE!!!! FINDING ANY 'TURQUOISE' 1ST PRESSING IS INCREDIBLY HARD - BUT MOST 1ST PRESSINGS THAT TURN UP FOR SALE ARE ONLY AVERAGE AT BEST. SO FINDING A REALLY NICE ONEIN THIS CONDITION, IS VERY, VERY RARE INDEED!!!! JUST TAKE A LOOK AT THE PICTURES!!!! THISIS THE ORIGINAL1969 UK 'EARLIEST' 1ST PRESSING ON THE'EARLIEST' 1ST PRESS RED/MAROON (PLUM) ATLANTIC LABEL, 'EARLIEST' 1ST PRESS'SUPERHYPE' CREDITS ON THE LABELS, 'EARLIEST' 1ST PRESS 'TYPE 1' LABELS, 'EARLIEST' 1ST PRESS INNER SLEEVE, 'EARLIEST POSSIBLE' 1ST PRESS 'UNCORRECTED' 1ST PRESS '588171 A//1' & '588171B//1' MATRIX ENDINGS,AND 'EARLIEST' 1STPRESS 'TURQUOISE LETTERED' FULLYLAMINATED COVER!!!! THIS LP IS SERIOUSLY RARE AND VIRTUALLY IMPOSSIBLE TO FIND LIKE THIS - SO DONT MISS OUT ON THIS AMAZING OPPORTUNITY!!!! This is the ORIGINAL UK Atlantic 1st Pressing from 1969 and is in BRILLIANT condition!!!! The record is pressed on THICK quality vinyl!!!! The Cat. No is 588 171 on the ORIGINAL 1st Press Red/Maroon Atlantic labels (see picture) and is a UK Stereo 1st Pressing (there were NO Monos!)!!!! The record labels are in SUPERB condition (see pictures) with NO wear, NO writing and only a few VERYlight spindle marks!!!! IT IS VERY CLEAR THAT THIS RECORD HASN'T BEEN PLAYED MUCH AT ALL!!!! The vinyl is in BRILLIANT condition!!!! Most of these 60s LPs had been to a lot of wild parties and are usually found totally worn out, and almost unplayable. This one is NOT and has NO scratches, only 2 or 3 MEGA light hairlines, only 2 or 3 VERY light TINY scufflines, and only a VERY few of the lightest paper scuffs only visible under light!!!! ITS AS SIMPLE AS THAT!!!! THE RECORD STILL RETAINS ITS ORIGINAL 'JUST PRESSED' LOOK AND SHINES LIKE NEW!!!! It is also great to find that the playing of the record is as STUNNING as the visual!!!! It plays with NO pops, barely ANY clicks AT ALL, NO jumps, NO sticks, barely ANY crackle AT ALL, and only some VERY slight background sound on the run on grooves & gaps - NOT in the music AT ALL!!!! The sound quality is simply SUPERB with NO groovewear and NOdistortion either!!!! The record must grade Very Good++ if not better - and is a very VERY nice record indeed!!!! Believe me this record is NOT overgraded in ANY way!!!! I use STRICT RC grading standards - it is not in my interest not to!!!! Brillant!!!! The record also comes in its ORIGINAL 1st Press inner sleeve which is in SUPERB condition!!!! The ORIGINAL 1st Press 'Turquoise Lettered'FULLY LaminatedCover is in BRILLIANT condition - and for once is still VERY flat looking indeed!!!! It has NO edge wear, NO spinal wear, NO nasty brown creases AT ALL, a few absolutely TINY and VERY light creases along the spinal edge (these are absolutely TINY and as minor as it gets! ), only VERY slight corner wear (NOT through the colour! ), NO rips, NO tears, only some very VERY minor evidence of 'tipping in' to the bottom 2 corner tips, NO splits, shiny laminate, only an absolutely MEGA thin line oflaminate lifting along the spinal edge, only a few TINY light 'half-moon' creases towards the right, barely ANY creases AT ALL elsewhere (cover is VERY flat looking indeed! ), NO annotations, and NO writing!!! !The opening edge is beautifully straight with barely ANY feathering AT ALL!!!! Even thelaminated back of the coveris in BRILLIANT condition with NO yellowing, NO grubbyness, only a MEGA thin line of laminate lifting along the spinal edge, and NO writing!!!! The cover must gradeVery Good++ if not better, and is a very VERY nice cover indeed!!!! THIS LP IS SERIOUSLY RARE AND VIRTUALLY IMPOSSIBLE TO FIND LIKE THIS (ESPECIALLY FINDING THE 'EARLIEST' 1ST PRESSING EVER MADE!) - SO DONT MISS OUT ON THIS INCREDIBLE OPPORTUNITY!!!! HAVE A LOOK AT MY PICTURES - I DO MY BEST TO SHOW THE RECORD FROM ALL ANGLES AND MAKE THE PICTURES AS CLEAR AS POSSIBLE - THERE IS NOTHING TO HIDE!!!! It really is a GREAT looking LP and it is truly rare to find any copies of thisMEGArare LP in this sort of condition!!!! THIS WILL BE YOUR ONLY CHANCE TO BUY AN ORIGINAL1969 UK 'EARLIEST'1ST PRESSING OF "LED ZEPPELIN" BY LED ZEPPELIN, IN BRILLIANT CONDITION!!!! Dontforgetto take a look at allmy other items including many other TOP LPs and contact me with any queries you may have. Postal discounts for multiple buys are always available - and I guarantee to ALWAYS undercharge on postage! Paypal, Bank Transfers, Cheques, International Money Orders, and Postal Orders accepted. Thanks for looking! Cheers!!!! !